With its muted, unassuming frontage, Fishers has graced Clifton Village’s Princess Victoria Street since 2001 – a pretty good lifespan to date, we reckon! It’s the sister restaurant to the Fishers restaurant in Oxford, and – importantly for a fish restaurant – is big on provenance: there’s a whole page on their website dedicated to their suppliers and their dedication to sourcing ingredients from smaller independents. We’d booked for a midweek evening, and were pleasantly surprised to see how busy the restaurant was. Walking in, you’re instantly hit by the nautical theme: the wall opposite the entrance is painted with a seaside theme, there are portholes in the doors to the kitchen, an “upper deck” sign above the stairs, ship lantern-style lights and a beautifully soothing blue and white colour scheme. 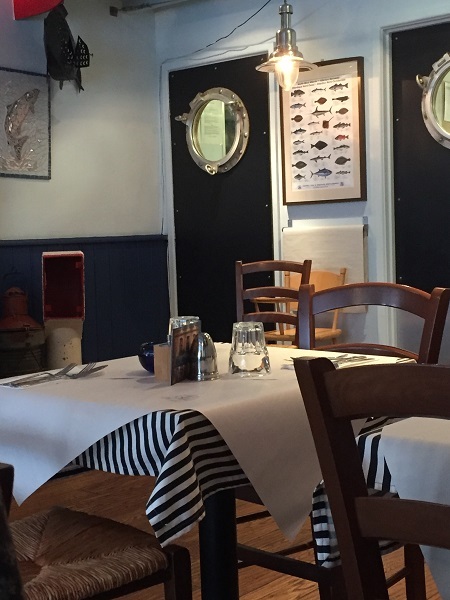 Blue and white striped tablecloths are topped with greaseproof paper stamped with the Fishers logo, evoking thoughts of chip shop paper, while gentle music is piped throughout the dining room. It’s a very quiet restaurant, and on the night of our visit it almost felt like we had to whisper. Over a Diet Coke (£2.35) and a large glass of fresh and light Torrontes (£7.55), we perused the daily-changing menu, the date printed at the top. With starters priced from around £5.50 to £8 and mains from £12.50 to £16.50, it’s a very reasonably priced list of dishes. As you’d expect, the focus is on fish and seafood – but on the night of our visit there was a steak on offer as a main and just one vegetarian starter and one veggie main, which seemed a little low. A complimentary bucket of bread and butter certainly whetted our appetites for the main event, although (a minor niggle) we were surprised to see that we were only given one slice of each type of bread bar the white sliced. 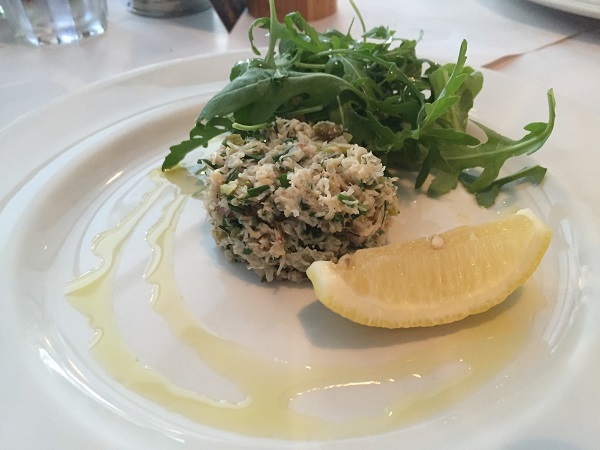 My meal began with a beautiful fresh, summer flavours: a Cornish crab salad (£8.95), the delicate taste of the crab enhanced rather than overpowered by the citrus and vinegar flavours. 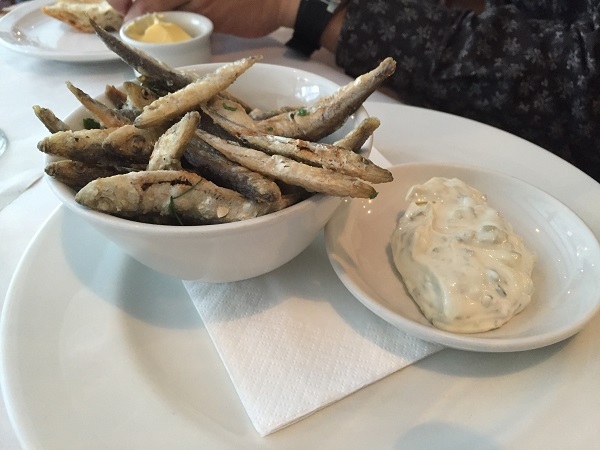 Chris went for one of his favourites: a portion of deep fried whitebait with tartare sauce (£5.95). It was certainly a generous portion. Lightly fried in flour rather than batter and well seasoned, he was pleased that the fish weren’t soaked in oil and tasted wonderfully fresh. The tartare sauce was lovely and zingy too, with big chunks of capers and cornichons. 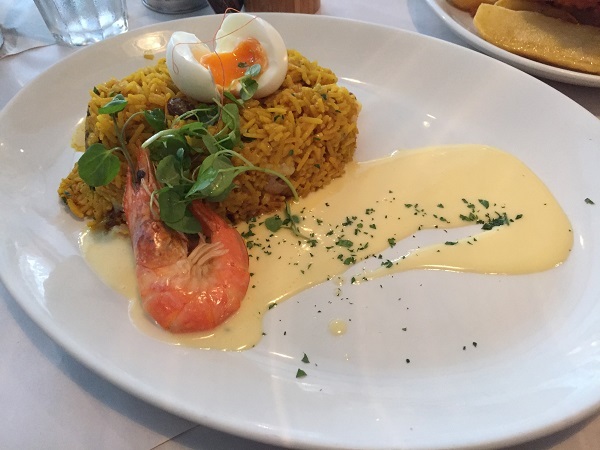 Though it’s often served as a breakfast or brunch dish, I was pleased to see a Fishers kedgeree (£12.50) on the menu, and chose this lightly curried rice dish for my main. Presentation-wise, it would have been better without the hollandaise – and flavour-wise I don’t think it was really needed either. The combination of tiny prawns, perfectly cooked flaked smoked haddock and rich, warming spices was a winner, though – and I loved the addition of dried fruit streaked throughout the rice. The big prawn on the side may be retro, presentation-wise, but it tasted incredibly succulent and fresh…though I could have done with a finger bowl post-eating. 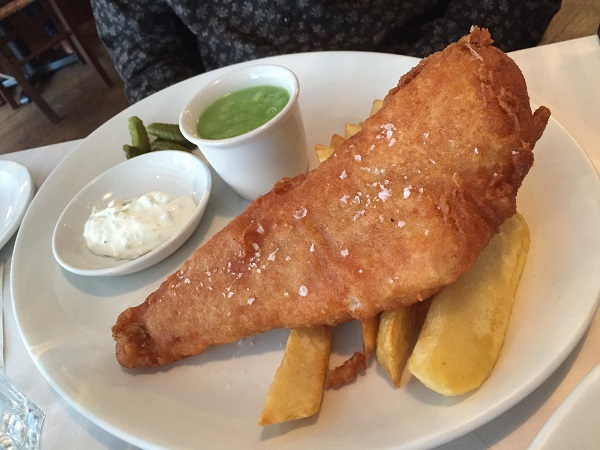 We often think that fish and chips is a real test of a fish restaurant’s quality, and Chris ordered the traditional beer battered haddock and chips with mushy peas and tartare sauce (£12.95) to test out the Fishers version. The fish itself was lovely and moist with no bones, flaking well under the fork. The batter was interesting – a different consistency to “normal” fish and chips, more of a crisp crust than a batter. He thoroughly enjoyed it, though. He was pleased to see a pot of the same tartare as was served with his starter, and the mushy peas were tasty enough. The chips, sadly, were a little disappointing: while one or two were crispy and fluffy, the larger ones were a bit floury – he’d have enjoyed them more if they were all smaller. They were well-seasoned, though, and he said that he’d happily order the dish again. We somehow found room for dessert, bypassing the smaller dessert options (ice creams, sorbets, vanilla ice cream with espresso and amaretto, lemon sorbet with limoncello) and instead went for the real deal. 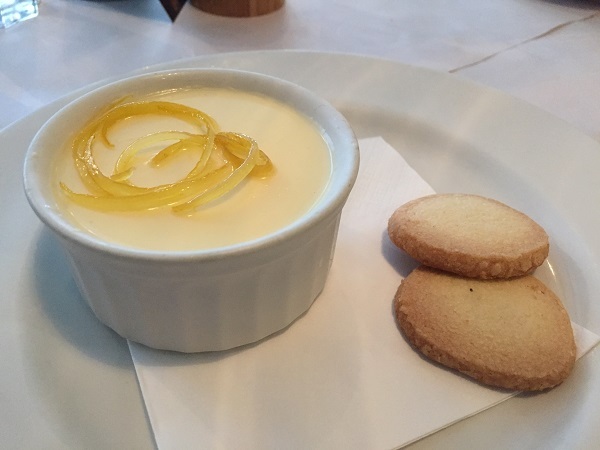 While we were tempted by the dessert sharing platter to get a taste of a range of options, I instead ordered the lemon posset (£5.50), which was presented beautifully. The posset itself was lovely and creamy with a great balance between tart and sweet, and was set well – although a layer of liquid at the bottom was unexpected. Garnished simply with very thinly sliced candied lemon and a well-made, crumbly shortbread with just a hint of salt, I was pretty impressed with my choice. Chris chose a simple pistachio ice cream with almond brittle (£5.50), the organic ice cream coming from Brookes Dairy in the Wye Valley, who have their own Jersey herd. 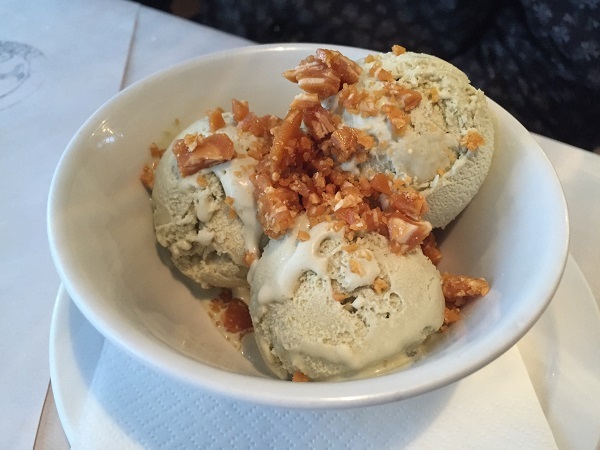 It was great to see a pistachio ice cream that wasn’t lurid green in colour, but the flavour was quite delicate – it could have been a little stronger. He loved the crunchy shards of almond brittle that decorated the top, though. A pretty good meal, all in all: service was friendly and efficient, the setting was beautiful (if a little too quiet), and the food was, on the whole, of great quality. 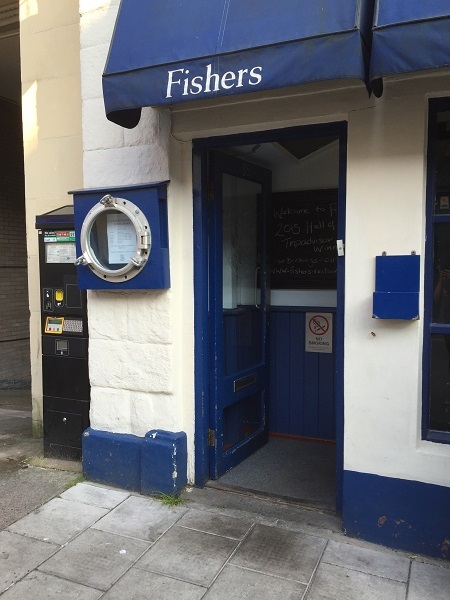 If you’re looking for fresh, tasty seafood in Bristol, then Fishers is a good shout. Please note: our meal was received free of charge, but this in no way impacted on our opinion. We were not obliged to write a positive review, and the venue did not see this review before it was put up on the site.